At 6IX MMA, you’ll learn Mixed Martial Arts in its truest form. A hybrid system utilizing the techniques of Muay Thai, Boxing, No-Gi Brazilian Jiu-jitsu, Submission Grappling and Wrestling as they apply to MMA. We adopt the strengths of each system and use them to complement each other from day one, making you a truly well rounded athlete who can transition seamlessly from discipline to discipline. Even if you’re not looking to compete, our goal will be to get you in a fighter’s shape, and arm you with their skills regardless. We’ll tailor the program to your needs, and make sure we help you reach your goals, whatever they may be! This program combines the fundamental skills you learn in our grappling and striking classes, as well as show you specific tactics and techniques for MMA. Students learn to execute takedowns, submissions, ground strikes and sweeps, making it a highly intense class. All skill levels are welcome, and we do our best to make sure you are partnered up with someone of similar size and experience to your own. Come be a part of the fastest growing sport in the world, in a safe and supportive environment. Come try our MMA classes! Our Striking classes are great because they cater to everyone’s needs or goals. If getting in shape is your main focus, these classes will give you one of the best workouts of your life. If Competition or self-defense is objective, these classes will prepare you for both. 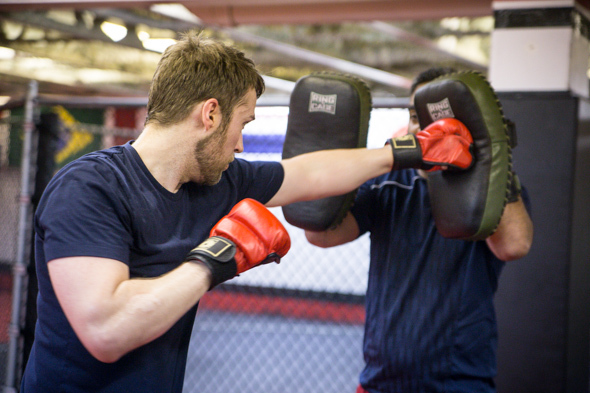 We have students who just come in for the fitness element, and we have Muay Thai Champions…and everything in between. These classes are intense, they are fun, and they are THE BEST way to get in shape and stay motivated! 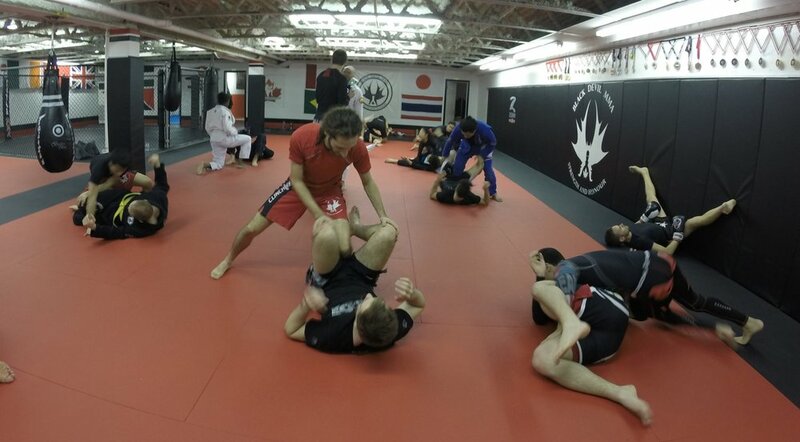 Nogi Brazilian Jiu-jitsu, as well as elements of Wrestling, Judo and Sambo are all taught as part of the Grappling Program here at 6IX MMA. These classes have it all. They are GREAT for self-defence, fitness, and competition. We teach you how to control an opponent and use their strength against them. You’ll learn sweeps, submissions, escapes…everything you would need to raise your confidence walking home, or make sure your hand is raised in competition. Like our striking program, the vast majority of our students train simply to get in great shape and have fun while doing so. Our competitive team has had HUGE success across North America taking medals at every event we enter! These classes are fun, safe, and a fantastic workout.